Each year, I.I.I. hosted a conference called Joint Industry Forum. 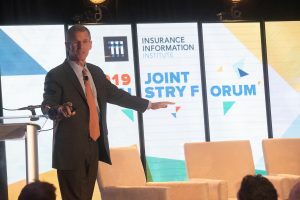 This unique event compiles key figures from business, policy, and media spheres to explore topics of vital interest to our industry. This year we were lucky to have four-star General Stanley McChrystal as the keynote speaker. General McChrystal was the commander of Joint Special Operations Command (JSOC) and the International Security Assistance Force. He shared important lessons on leadership that he acquired while leading efforts to al Qaeda in Iraq. The Violent Command Chain. Giving everyone in your organization the information you normally give C-suite leads to "authorized driving". In our fast world there is not always time to let everything down a long command code. Give employees the freedom to use their own judgment. "Perform the order, but if the order is wrong, run the order we should have given you ." Don't just "follow the procedure" be an excuse for actions that are inappropriate for the situation. Think of the leader's role as a gardener. A gardener does not grow plants, only plants can do it. Instead, a gardener, weeds and protects the plants, so that they can do what they do best. By enabling the organization, you will be sure to see a positive result, McChrystal concluded.